Here's another [Side Stories] for you that would've been forgotten otherwise (plus, there needs to be interesting posts--and this one is at least a bit more light-hearted than others). I do love local ads of most types (car dealerships being mostly an exception), and I remember browsing through a phone book, and finding the ad for Dr. Gary R. Badger, DDS. 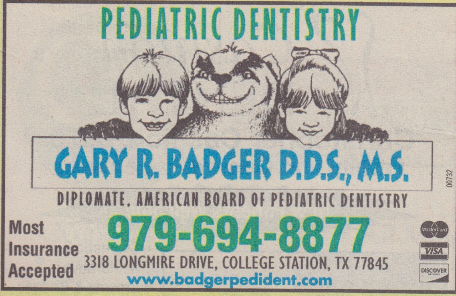 I never went to Dr. Badger's pediatric dentistry or have any other connection with the man, so I can't tell you what he was like, but his ads were...well, take a look for yourself (he even had it on the uniform!). The worst part is imagining all those poor children who created a mental image that this was what Dr. Badger really was like. Actually, those kids, with their blank, dead eyes seem to take away some of the effect. In any case, Dr. Badger later added Candace Light, DDS to his practice (about five months ago, both signs were on the door), but Dr. Badger had retired. Light renamed the practice to "Light Pediatric Dentistry" and created a new marketing brand, this time focused around the sun and blue skies (light). Thus has ended the ads of Dr. Badger, but I'm gonna miss them. They were original: I have no idea who created the badger drawings, but it was definitely an eye-catcher in any advertising medium. Editor's Note: The other day we alluded to a "big post on College Main buildings", which, despite the name and all, will be smaller than the big Northgate post. However, it will have more information than what is currently featured, and will feature more pictures. There will be something either tomorrow or Saturday which you'll definitely like and may have liked them in the past. Maybe.